Yesterday I tried another new recipe, this time one I threw together myself. It was kind of a “what’s in the fridge” recipe. I had some frozen okra and lima beans that had been taking up space in the freezer for several months, and I also had 2 peeled sweet potatoes that needed to be used. I sliced the sweet potatoes thinly and sauteéd them in olive oil, then added some green pepper and chopped onions we had in the fridge as well. Then I added the okra and lima beans, along with some seasoned salt, Ms. Dash, coriander, cayenne pepper, and salt. For serving I topped with freshly diced tomatoes out of the garden and avocado chunks. I decided to call it New Orleans hash mostly because of the okra. It turned out ok, but not great. It was definitely quick and easy. Clare and I both decided (or were reminded) that we don’t care for lima beans that much. Clare also thought that it could use some vegan sour cream or some kind of sauce. We definitely like the sweet potato black bean hash recipe from the Moosewood New Classics cookbook. It would be nice to have another sweet potato dish that in the repertoire that is just as tasty, but different enough from that recipe. I think next time I might try a different kind of bean, some sort of sauce. It might be good to put in a little vegetable broth near the end, and save the okra for last as a thickener. 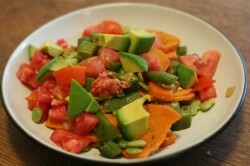 This entry was posted in cooking and tagged beans, hash, okra, sweet potato. Bookmark the permalink.